As part of the on going Enrichment Series, the Athertyn team and the Pohlig Organization are inviting folks to be their guest on an exciting journey to adventure, self-discovery and learning. Join us to view and discuss clips from great Hitchcock films, as well as to learn about the director and some of his most notable cinematic trademarks: blonde women in trouble, danger in everyday places, Machiavellian matrons, and of course, his iconic cameos. This event will be presented by Andrew J. Douglas, Ph.D. 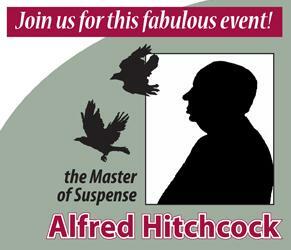 The Athertyn team, the Pohlig Organization, and Andrew J. Douglas, Ph.D. present "The Master of Suspense, Alfred Hitchcock"
This event will be held Wednesday, April 27th, 2011 from 7:30 to 9:00 pm at the Athertyn Clubhouse, 7700 Parkview Drive, Haverford, PA. Those interested in attending this event can R.S.V.P. to Carrie Sullivan at 610-647-4700 or send an email to info@athertyn.com to reserve seats.